Our practice provides physiotherapy care for Back Pain (Lower, Mid or Upper) to the local Adelaide area as well as the surrounding suburbs of Medindie, Medindie Gardens, Walkerville and Prospect. Back pain or back ache is a symptom that can arise from many causes including arthritis, muscle and ligament strains, disc lesions, osteoporosis, sciatica and stress. Many cases of upper and low back pain and sore backs in general are caused by stresses on the muscles and ligaments that support the spine. 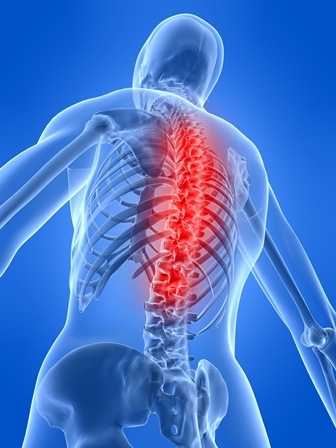 Back pain affects patients of North Adelaide Physiotherapy in the neck (cervical spine), mid back (thoracic spine) and lower back (lumbar spine). At North Adelaide Physio we deal with a high volume of cases of back pain/injuries and have a proven track record to providing good relief! Our staff here are specially trained in dealing with back related issues whereby digital spinal analysis, X-rays and a comprehensive physical exam are utilized to determine the exact cause of the back pain. We know that everyone is different and therefore we tailor a management program that best suits you! A ‘generic’ treatment formula simply won’t work if you want to stop your pain from coming back. Here at North Adelaide Physio we also take a ‘holistic’ approach to one’s back problems; as such we also consider and give advice on lifestyle factors that can contribute to back pain. Majority of cases of back pain are aggravated by lifestyle factors, including lack of exercise, schoolbags, being overweight/obese, sedentary lifestyles, poor posture, stress and bad work practices. In relation to obesity – we can also provide superior quality weight loss supplements to assist in this area. We address all of the contributing factors to prevent the pain in your back from coming back for good. Many back pain ailments can be addressed easily and quickly but those with serious and chronic back pain often benefit from an ongoing maintenance program at North Adelaide. Simply, our Better Back Program is a tailor designed treatment program to address the exact cause of your problems and to get you back to your favourite activities fast! So if your back is holding you back from sport, occupation and other activities or you just simply have pain whilst sitting or getting in/out of your car then our Better Back Program may be the answer for you! Our Better Back Program involves an initial assessment with one of our highly skilled North Adelaide Physiotherapists, a digital spinal analysis to assess the areas under most stess in your spine, digital gait scan to see how evenly you are distributing pressure on each leg (and hence the pressure distribution across your spine), XRays, a detailed 3 week hands on program and exercise program and a reassessment at the end of the program to assess your improvement. You will also receive a detailed report at the beginning and conclusion of your back therapy to show your progress and your doctor and relevant specialists will receive a copy also so that everyone in your medical team helps you move towards being fit and painfree.